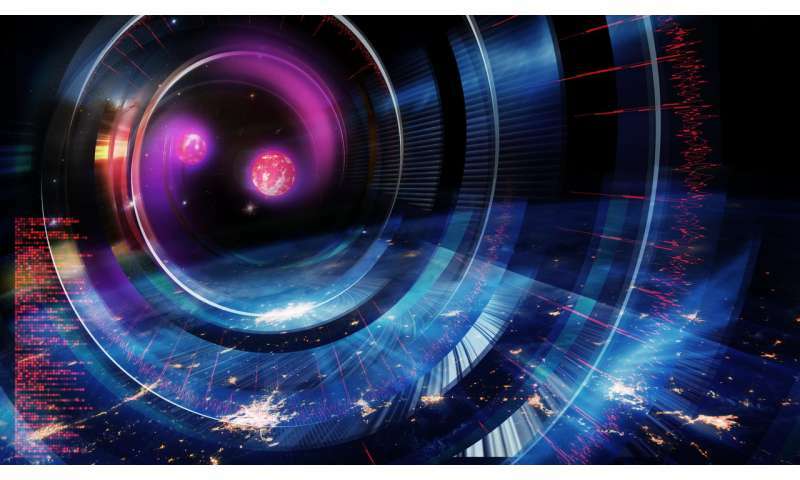 The Australian National University (ANU) is playing a lead role in Australia's involvement with the gravitational wave discovery through a partnership in the Advanced Laser Interferometer Gravitational-wave Observatory (LIGO), which is based in the United States. 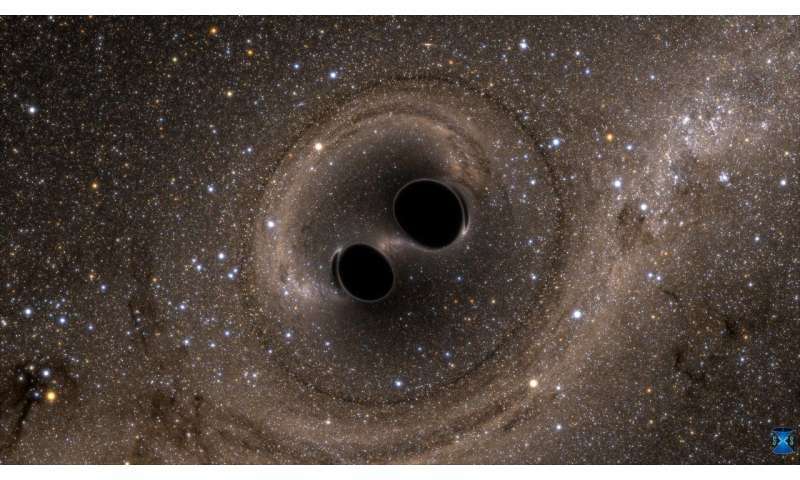 Professor Susan Scott, who is Leader of the General Relativity Theory and Data Analysis Group at ANU, said the team discovered the four collisions by re-analysing data from Advanced LIGO's first two observing runs. "This event also had black holes spinning the fastest of all mergers observed so far. It is also by far the most distant merger observed," Professor Scott said. "These were from four different binary black hole systems smashing together and radiating strong gravitational waves out into space," said Professor Scott, who is from the ANU Research School of Physics and Engineering and is a Chief Investigator with the Centre of Excellence for Gravitational Wave Discovery (OzGrav), which is funded by the Australian Research Council (ARC). "These detections of black-hole collisions greatly improve our understanding of how many binary black hole systems there are in the Universe, as well as the range of their masses and how fast the black holes spin during a merger." "This increased the sensitivity of the detector network allowing our searches to detect more sources," Professor Scott said. "We have also incorporated improved models of the expected signals in our searches." "This means during the upcoming third observing run, starting early next year, we will be able to detect events further out in space, meaning more detections and potentially gravitational waves from new and yet unknown sources in the Universe," Professor Scott said. The international research team has detected gravitational waves from 10 different black-hole mergers and one neutron star collision during the past three years. Neutron stars are the densest stars in the Universe, with a diameter of up to about 20 kilometres. Professor Scott's research group is also designing a new project to enable them to detect gravitational waves coming from a short-lived neutron star resulting from a neutron star merger. Dr. Karl Wette, a postdoctoral fellow in the group at ANU and a member of OzGrav, said scientists were not sure what was formed from the neutron-star merger that was detected in August last year. "It could have been a neutron star that collapsed to a black hole after some time or turned immediately into a black hole," he said. "Our new project will help to provide critical information about what we get from the merger of two neutron stars." Professor Scott will present the new results at the Australian Institute of Physics Congress in Perth later this month. What do they mean when they say 80 times bigger than the sun? 80 times the mass or 80 times the diameter? 80 times the mass of the Sun would of course be big, but a black hole 80 times the diameter of the sun would contain an incomprehensible amount of mass. @Whyde, we've detected that many times now. But if you're talking about a merger of SMBHs LIGO doesn't have the right spectrum to detect it. The ones it can see are in the (approximately) 10-100 solar mass range. To detect when SMBHs merge, we'll have to wait for ELISA. Unfortunately, @sparc and @Nik, this was written by the Australian National University, not physorg. A silhouette would be direct. Would be like painting yourself black and standing in front of a moire pattern poster. Remember though that it's a silhouette of the photon sphere, not the event horizon. 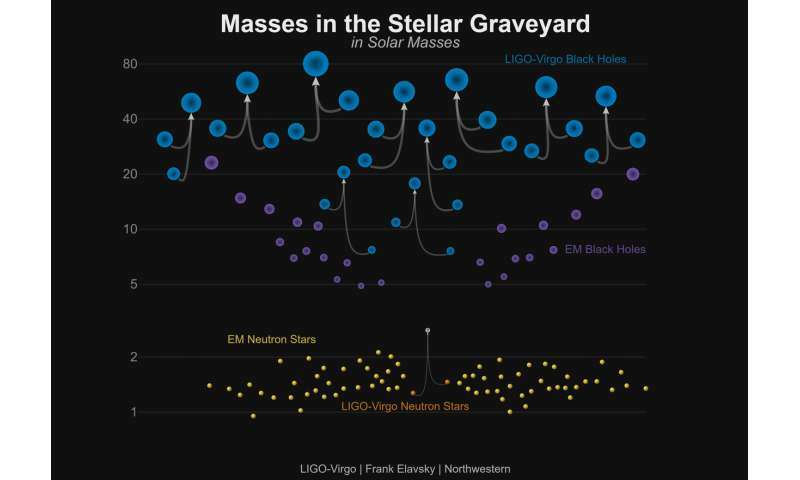 For anyone who didn't bother to read the article or look at the illustrations, the chart clearly indicates the alleged mergers detected so far -- and one is of a slight less 40 mass and slightly bigger 40 mass solar black hole -- totalling about 80 solar masses. please explain the chart's reference to "EM Black holes and Neutron stars" in the context of the indicated mergers, please. This merger occurring at an estimated 9 billion lights years (lys) distance is quite surprising. Now we have some ten confirmed mergers from about 1 billion to about 9 billion lys out. It suggests some serious explaining needs to be done. At 9 lys out, shouldn't we be seeing a lot more mergers than what has been seen so far? It is hard to imagine that the signal strength alone was all that allowed us to see this largest merger, creating a black hole of some 80 SMs. @Da Schneib, considering the increase in volume of space from 1 billion lys distance to 9 billion lys, shouldn't we be seeing a lot more distant mergers, than closer ones, and/or a lot more anyway? The universe was much denser that long ago. Should have had many more jumbo core-collapse black holes floating around. Could anything, anywhere at all, be interfering with the detectors? @df, I don't think that black hole mergers of the indicated size would be more or less common over that short a time; if it were 12 or 13 billion light years I might think it significant. Also, since gravity is inverse-square, there will be a competing fall-off in signal strength with distance. This science is very young, and I'd be wary of drawing conclusions too quickly. Ask me in 20 years if I'm still around. Considering that binary black holes (BBHs) most likely arose from binary giant stars (BGs) going type II and eventually merging, one wonders at what frequency binary giant stars exist in general, and what number of these would then give rise to BBHs. Most but not all?! If BBHs are rare because binary giants are rare, than that is understandable. It would seem at least that this might be a good starting point for estimating the rate of black hole mergers. One images that for any given gas rich galaxy at a similar evolutionary state, a considerable number of binaries (which are most "stars") must contain two giants. I understand the rationale for expecting many more mergers 9-13+ billion years ago, but to confirm only 10 in the last few years from many trillions of galaxies seems a tad on the short side. Only 10 mergers?! Just doesn't seem reasonable. I would expect at least some orders of magnitude more. They simply cannot be that rare with all those galaxies. It would seem at least that this might be a good starting point for estimating the rate of black hole mergers. Heh, theories will rise and fall in the next twenty years based on what we see. But it's going to take a really long time. Keep in mind that black holes are an end state; there are plenty of globulars around that contain Population III stars indicating they were formed very early in the history of the universe. No question about theories rising and falling. They have been doing that for a long time. I suspect more advanced instruments will begin to detect more and more mergers as time goes by. As I recall, they did not detect any mergers until they realized that the sensitivity they were initially working with was too low. They goosed the system and shortly afterwards found the first merger. From this alone I am going to estimate that they will have instruments sensitive enough to detect such mergers coming in one a day, or more. Moreover, we should see an increase in the number of mergers the further out you "look". Signal strength could have a lot to do with my missing mergers. Perhaps there are a lot of smaller ones that are not yet detected, but still amount to that larger merger number that I am expecting. Hmmm, I won't take your bet, but I'd say more like once a week, just off the top of my head. One a day, or one a week. It will all depend on the instrument sensitivity and merger masses. The signal strength rules in the end. @Richk, I believe what they are talking about is Electromagnetically detected BH's and Neutron Stars. So they are showing the comparison in size and what size BH's and Neutron stars impacted detected by LIGO and the corresponding sized of ones detected by X-ray, IR and other high energy sources as black holes and neutron stars, especially pulsar/magnetars which we can study. Watching a known magnetar join with another neutron star or BH would be Interesting, to say the least. But notice how there are some close similarities in masses, as well as the proportions of masses, even visually, looks very similar to elemental fusion in the heart of stars or in supernova/kilonova events with large releases of 'energy' in dense mass, as well as a heavier end product. Not saying that it IS the same, too much difference in structure from what we know presently, but pointing out what looks almost like a fractal iteration of same proportional effects writ VERY Large upon the Cosmos. Something that puzzles me: the references to the spin rates of the black holes before/after collision. I thought conventional wisdom has it that all the matter and energy that is inside the holes event horizon falls to the center - to a singularity. By definition a singularity has no radius, it is a point - how can it have a spin? If a point - it lacks a radius, a center, and any mass outside of the point location that could rotate around the center - it is the center. @Anonym We don't have math to describe what really happens in a black hole. The current math is inadequate. It's an approximation.